A few minutes in a hot dry pan can waken up ground spices and dried herbs to give any dish a more robust flavour. Be careful to stir the spices, so they don’t burn, and give them 2 or 3 minutes in the pan. When the fragrance has intensified to a pleasant level, add the rest of the ingredients. In this case, can of organic diced tomatoes with no salt added to make spaghetti and meatballs. Posted in Herbsday, Ingredients, Kitchen Hacks and tagged cooking, cooking tips, herbs, kitchen hack, Kitchen Hacks, Marinara, pasta, pro tip, sauce, spices. Bookmark the permalink. Knowing that I was having family over for a simple dinner to ring in the New Year, I started thinking of what else I had and what I could do with these extra carrots. 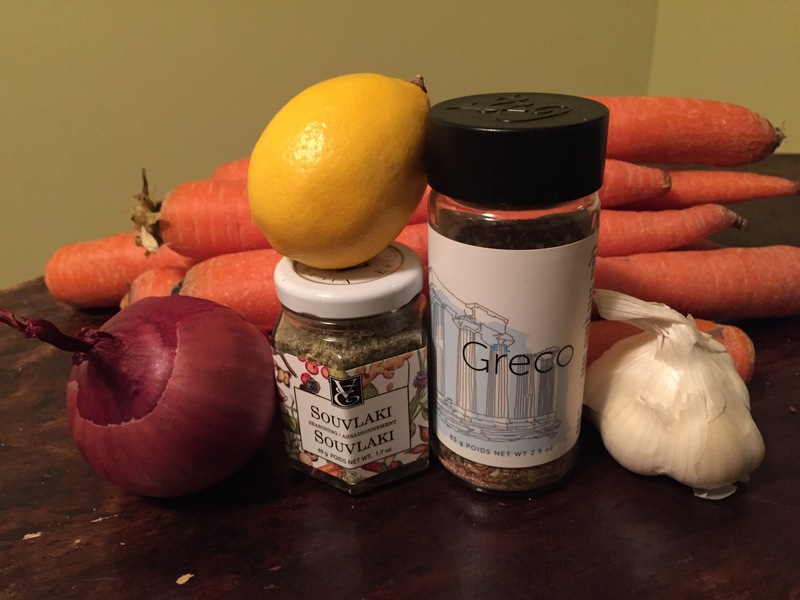 I knew I had lots of onions and lemons, a bit of feta cheese and some Kalamata olives, this had me thinking Greek. Recalling that I had Epicure’s Souvlaki seasoning and El Greco Secret Sauce, a plan came together. While this was a simple dish to throw together, I actually prepped it the night before so I could have more time to relax and reminisce about the year that was ending, the soup was greeted with rave reviews and encores of second and third helpings! I knew I had to share this recipe when my Instagram post was shared by Epicure on their Facebook page as part of their weekly round-up of images shared on Social Networks featuring their products. I also served a simple salad of thinly sliced bell peppers and cucumber (using my Epicure Ceramic Slicer) dressed with Epicure’s Greek Dressing seasoning mixed with red wine vinegar and Extra Virgin Olive Oil. If you would like to purchase Epicure seasonings or cookware, please visit my online store: www.juliaustine.myepicure.com or contact me for samples. What is your favourite way to use up a carrot surplus? 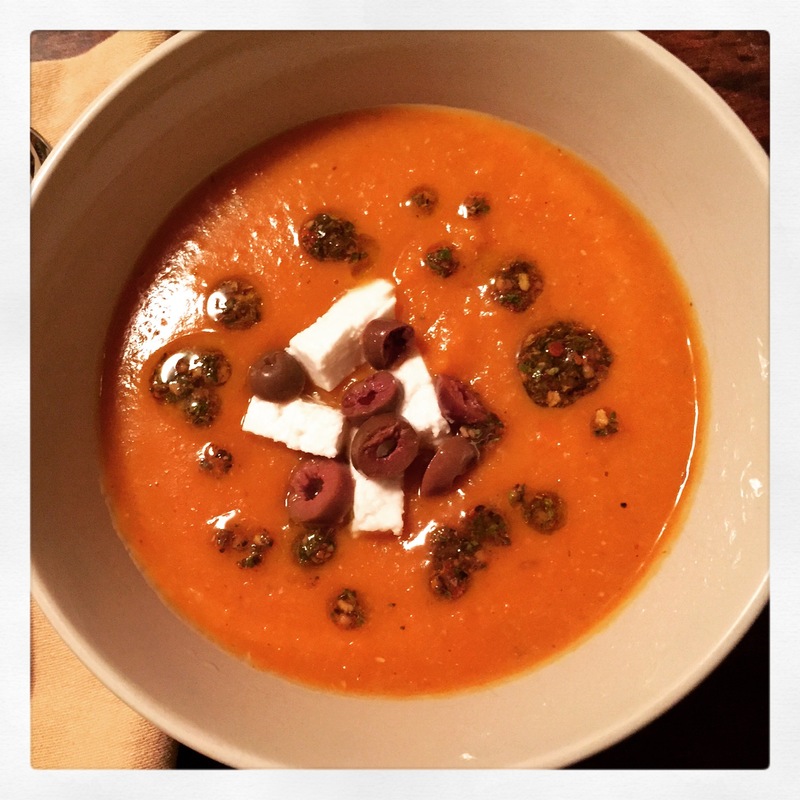 Posted in Breakfast, Gluten Free, Holiday, Ingredients, Kid Friendly, Recipes, Vegetarian and tagged carrot, cooking, easy, evo, Feta, garlic, Greek, healthy, homemade, kalamata, Kitchenette Finds, lemon, nutritarian, olive, olive oil, olives, onion, onions, oregano, recipe, roasted, soup, vegetable, vegetarian. Bookmark the permalink. While pieces of my kitchen have appeared in the background of pictures of food, I thought it was time to put the work space front and centre. We redid the kitchen JUST in time to host our families for Christmas 2011. I wouldn’t recommend cutting it as close as we did, wee bit stressful. 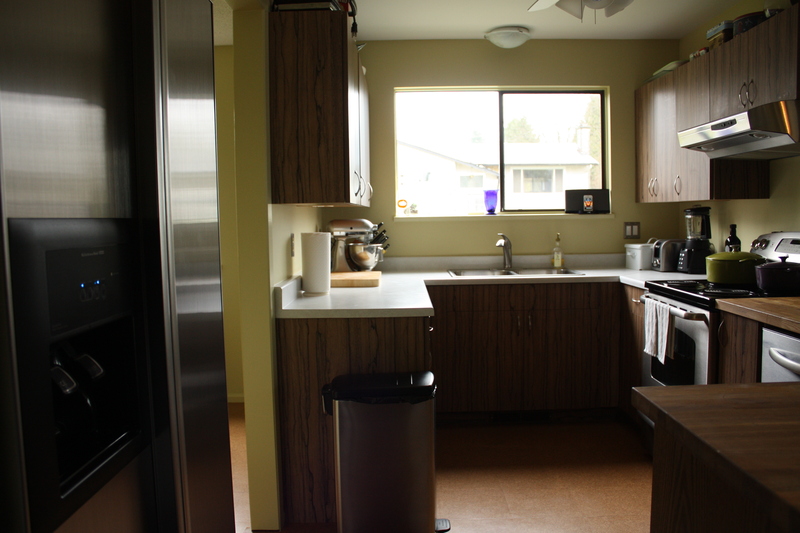 We replaced the stove and fridge, added a dishwasher, recovered the existing cabinets and added more counter space and open shelves. 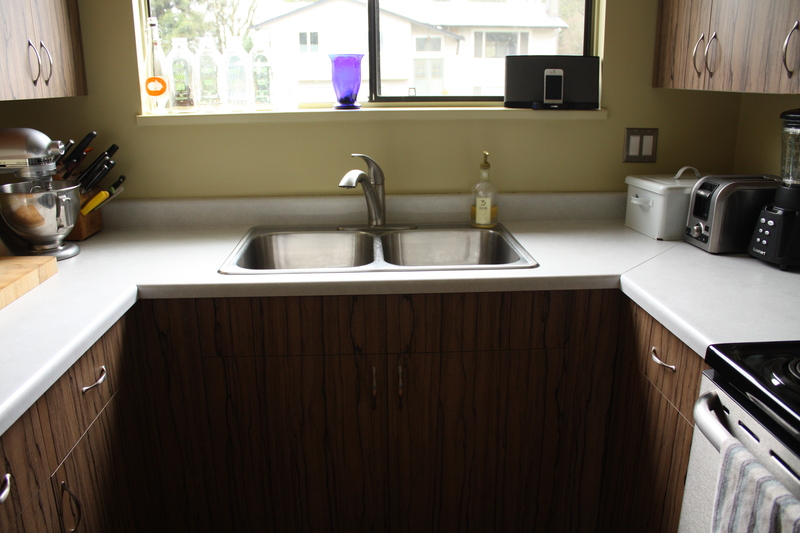 We kept the sink and counters, as we were trying to keep the budget down. The faucet is new can be pulled out to fill large pots. By leaving the counter we saved a bundle and figured it would be easy to do later if we changed our minds. We were going to get a glass top stove, but the sales rep basically talked us out of it. Our dream stove would be gas, but this isn’t our forever house so we kept it electric. 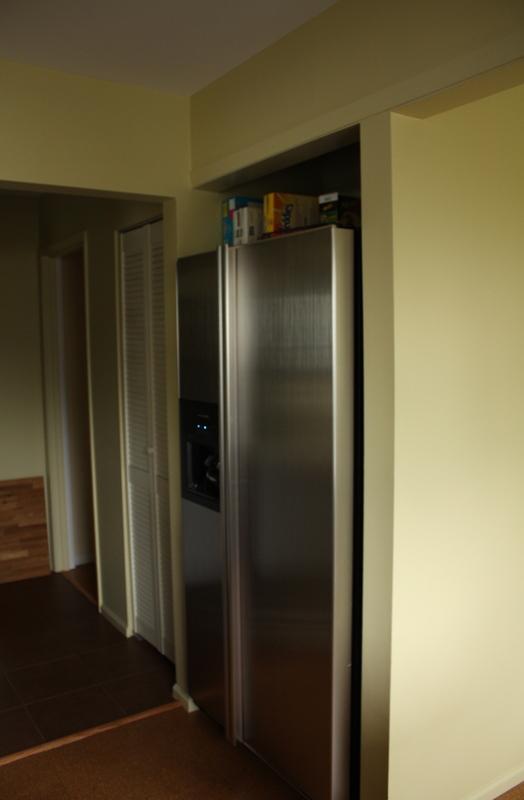 The fridge was the fanciest upgrade in the kitchen, with side by side compartments, ice machine and filtered water. It was larger than our previous refrigerator, but just by removing a bit of moulding and a dusty shelf it fit like it was custom-made. 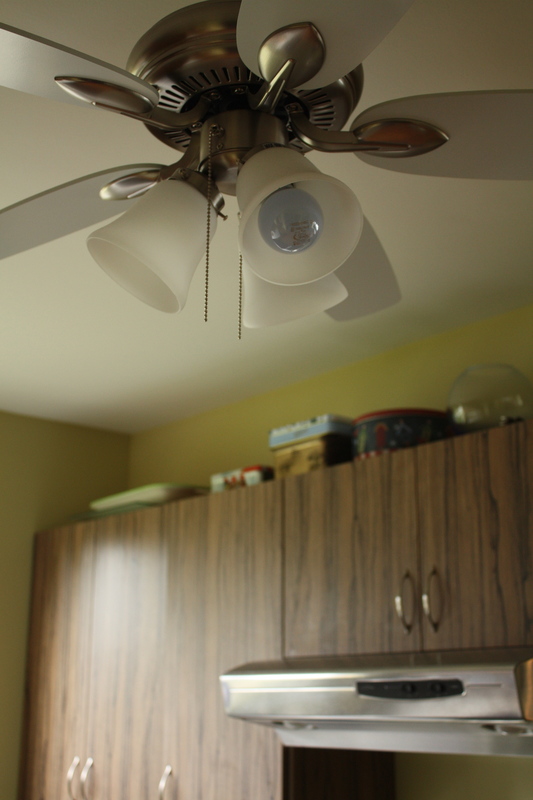 The light fixture with fan is the priciest light fixture in our house, with all the rest coming from Home Depot, but it’s also the prettiest! Combined with the new hood any smells and smoke are whisked away in a quiet gust. We added some butcher block counter top to the right of the stove to give us a larger work space. 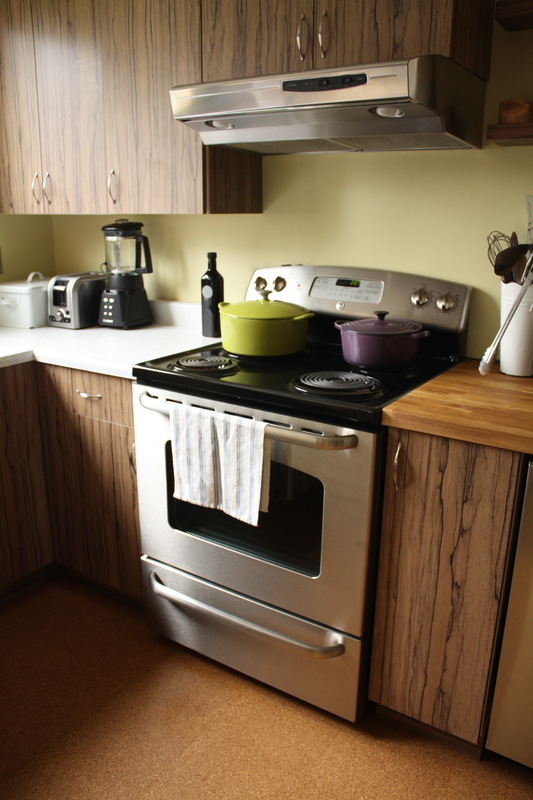 It was really a one person kitchen before, now it’s a 2 adult and a growing chef space. 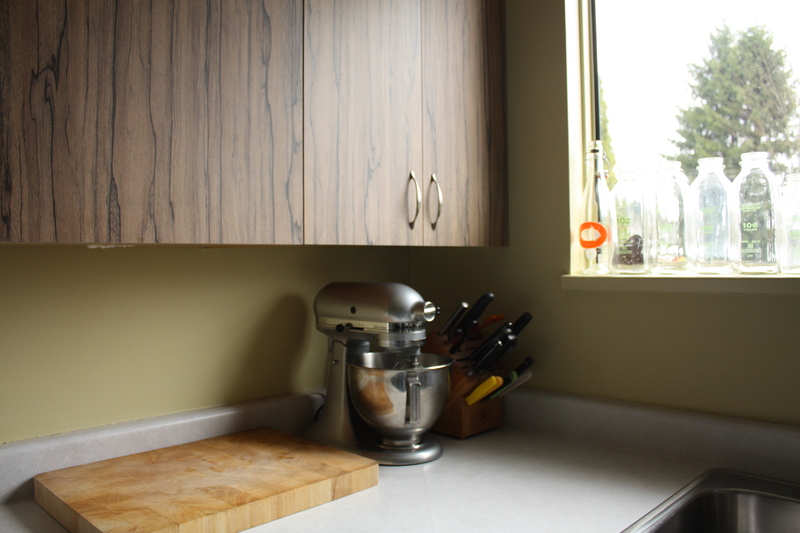 The butcher block is in an L shape and covers the dishwasher and some open shelves for small appliances and bakeware. The Pacojet has since found a new home, where it will be used more than once a month. 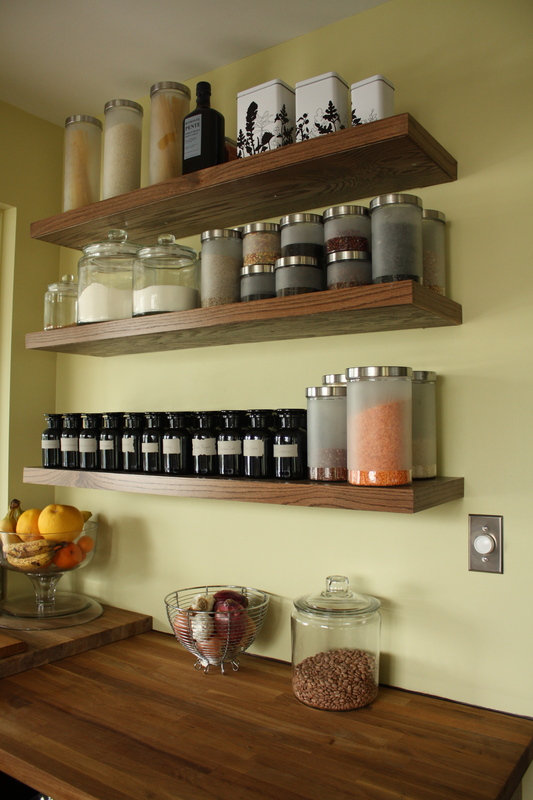 My husband, Exec Chef designed these floating shelves that hold my spice jars, grains, beans and other dry goods. We always have a fruit bowl on the counter for quick snacks and garlic and onions out for easy access since we use them daily. 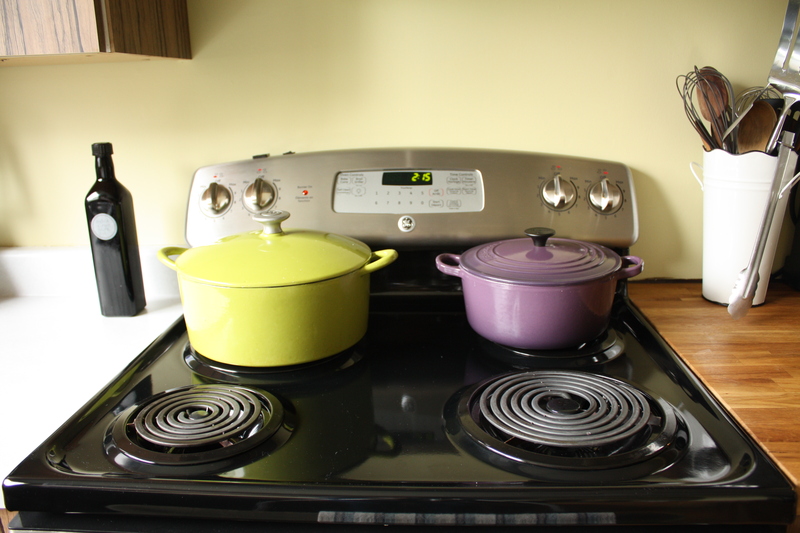 We also added two small floating shelves, of the same design, to the right of the stove. 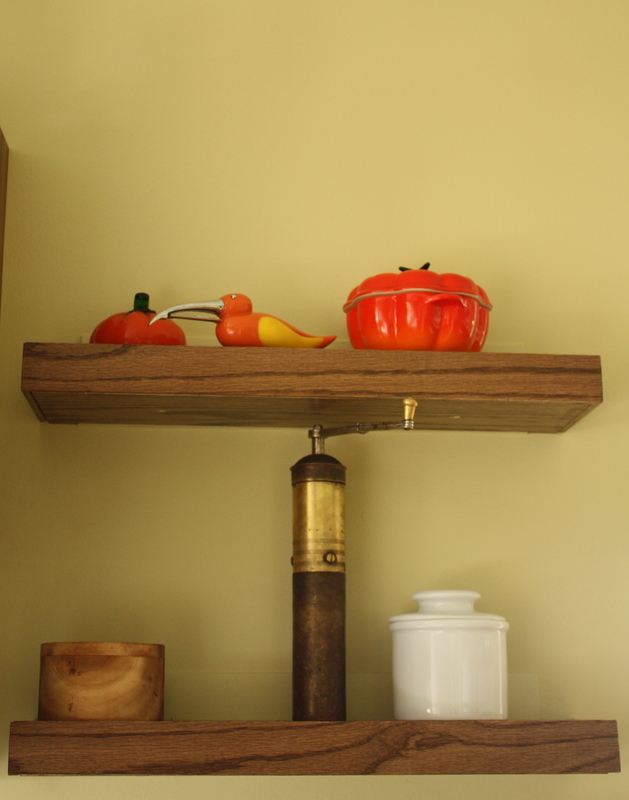 The lower shelf holds our kosher salt-cellar, pepper grinder and butter bell. On the upper shelf, I displayed some orange themed implements. To the left of the sink, we have our knife block (away from little visiting hands) and my beautiful KitchenAid mixer, which I may not use everyday but it does make me smile. 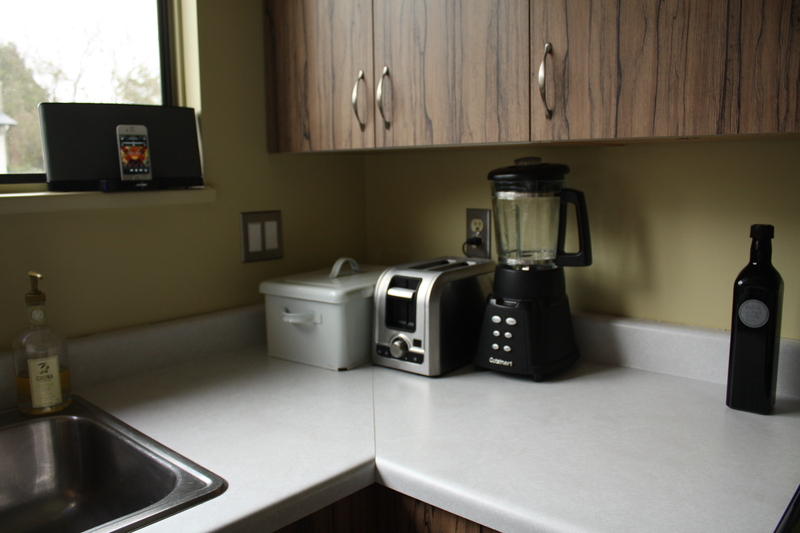 To the right of the sink, we have our DJ station, bread box, toaster and blender. Which covers breakfast in our house on many mornings! The bottle matches my spice jars and is full of fantastic olive oil. 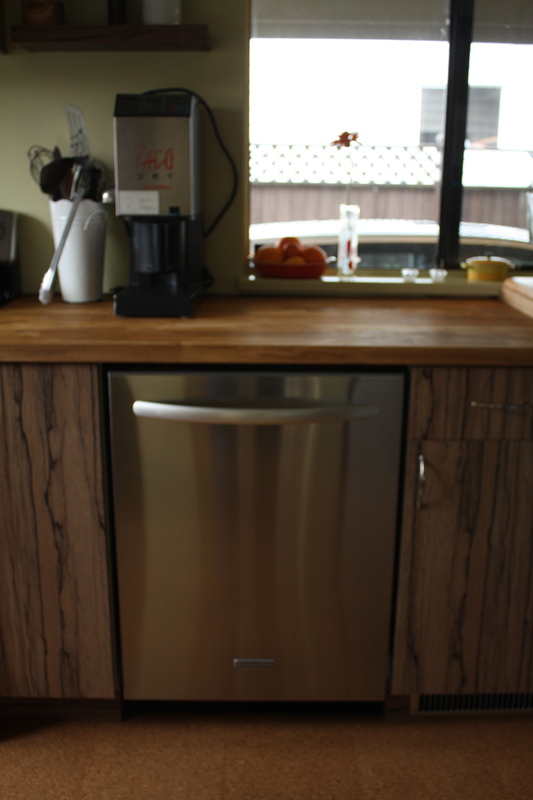 Thanks for taking a virtual tour of my shiny kitchen, it will never look this tidy again! What is the one thing you wish you could most change about your kitchen? Posted in Photos, Places, Tools and tagged cooking, counter, food, fridge, Home and Garden, Home Depot, Kitchen, Kitchen and Dining, KitchenAid, Light fixture, oven, Refrigerator, reno, renos, renovation, renovations, Shopping, sink, stove. Bookmark the permalink.